A few weeks ago I resolved to mark my third year of blogging (the anniversary of which is this coming week, I think?) by taking 30 minutes each day to write and by posting on the blog at least three times per week. I’ve mostly succeeded. I think I’ve written almost every day, though a couple were such blurs of activity that I’m pretty sure they were left off. I did the thrice-weekly posting for the first two weeks, but this week I’m likely only fitting in two. Oh well! On we march. The whole point of that little promise I made to myself was to exercise my writing muscle, so to speak, and I’m doing that. Being the weekend and all, I have my mind on lazy mornings and delicious coffee, and I’m thinking about what I would say to you if we were sitting down together for coffee. I think I would mention this post and how some people seem to have gotten the impression that I had lost my cool with my son and was therefore writing from a place of regret. Um… if you think that was me losing my cool, you are far too generous. I promise that I am capable of some truly outrageous meltdowns. Like, spittle and popping veins outrageous. Once I was so mad I even had to go outside to run laps across the backyard. So that post? That was just me recognizing the opposing tugs a parent feels while administering a punishment. And being decently comfortable that (in that one particular situation) I’d dealt with it the right way. I’d probably complain about being really, really tired of having somebody in the house sick for, like, two months straight. Currently we’ve got two boys (hopefully!) wrapping up their colds. I’m praying that we enjoy at least a small period of good health before somebody else goes down. 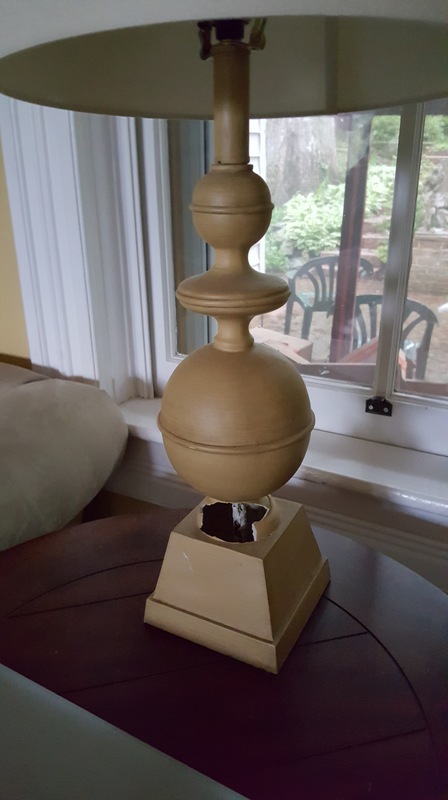 I’d tell you that I’d failed, once again, to find lamps to replace the ones my boys destroyed ages ago. It turns out it’s not so easy to find lighting that is (1) sturdy enough to withstand being knocked off tables by little boys and (2) not so sturdy that it will seriously injure little boys while falling off tables. 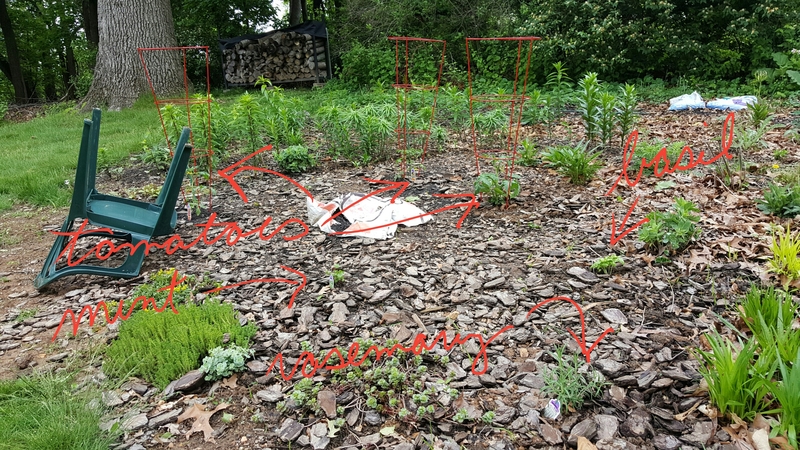 If you and I had time to discuss all the ideas we have for our homes and gardens, a la this post, I would report that I exercised some restraint by only planting tomatoes and herbs when I really wanted to go whole-hog and establish The Most Amazing Kitchen Garden Ever. I might admit to making myself yet another schedule to try to get a handle on my life. I’d say how we really just need to decide whether to get a playset and patio furniture, already. By this point I’d have bored you to tears – and we’re caught up by now anyway, so I’ll sign off. Time to see what kind of Mass behavior my boys give us this time. I am about to do something stupid. I’m about to hit “publish” on a blog post on how to get children to behave well in church, mere hours before taking my own children to Mass. They’re going to be terrible – I just know it. Since it seems to be a perennial question on social media (and because I’m a glutton for punishment), I thought I’d share our strategy for getting our children to refrain from causing a ruckus during Mass. But I’m not going to lie to you – it is not made up of quick fixes. There is no magic bullet – at all, for anything – when it comes to children. There’s a lot of hard work, a few clever ideas, and a decent measure of luck. In this post, I’m going to first offer you the two “hard work” elements of our strategy and then the six that might fall into the “clever ideas” category. The luck is up to you. 1. We have an expectation that our children will obey us. Our kids operate under the assumption that when Mommy or Daddy say to do x,y,z, it is to be done. They certainly don’t obey us all the time, but we have reasonable confidence that when we give them a direction, they’ll follow it. To some, this will seem so obvious as to not be worth mentioning. To others, it will seem like a pie-in-the-sky idea. Either way, unless you’ve been blessed with a child who is naturally mild-mannered (not us!) and pleasing to the general public, it’s the most basic of foundations for functioning well outside the home. (And inside the home too, I’d wager.) We have to trust that when we tell our child to stop and we raise an eyebrow and give him that look, he’ll stop. How do we do this? How have we gotten to the point where we can reasonably expect our children to obey us, at least in public? Lots of hard work. Lots of consistency, follow-through, consequences… and some yelling. I’ll admit it. 2. Our children are able to sit for the duration of a meal. In our home, you stay strapped in a booster until you can demonstrate that you’re able to stay seated without it. We’re currently in the transition stage with our two-year-old. If the mood is right, we’ll let him sit there unstrapped, but once he starts trying to get up (and ignores our calls for him to sit back down), we strap him in. He’s learning. At any rate, I really think the meal thing helps. Our boys are used to sitting in one place three times a day, for between 20 and 60 minutes a pop. So while sitting in church can be a challenge, it’s not a shock to the system. 3. 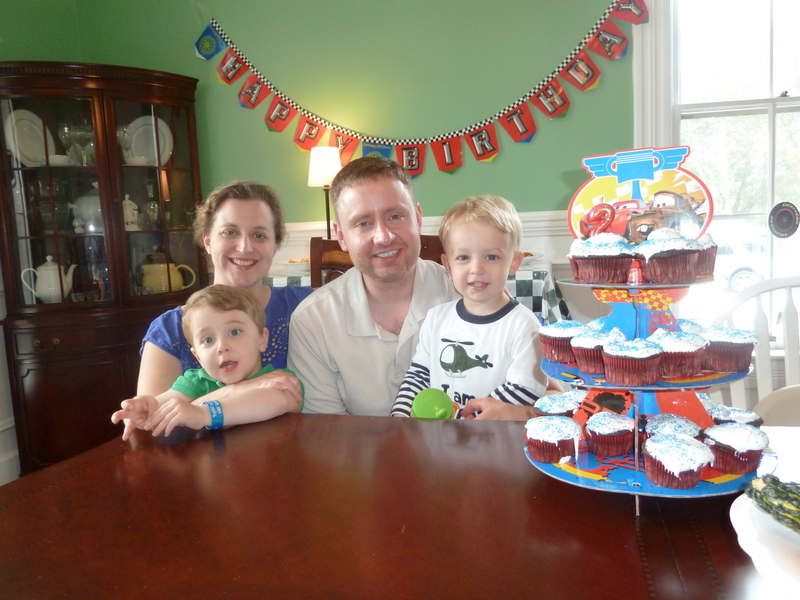 We have age-appropriate expectations for how our children should behave in Mass. First of all, let’s just make an exception for the 12-24 month range, shall we? My husband and I have found, with each of our children, that little babies in church are no big deal. Bigger babies may need some creative hushing when they become vocal, but they’re still not that difficult. But then you bang up against mobility. From the time our children can crawl through the time (somewhere around the age of two) we can begin to reason with them, there’s just really not much to be done. We can try all the strategies above and below, but it’s always going to be a crapshoot. In that age range, we keep them in Mass as long as possible, but if they become disruptive, we take them to the back of the church. I prefer to stand in the vestibule with the child, letting him walk around but not run, hushing him when necessary, and demonstrating to him that I’m still paying attention to the Mass. My husband sometimes prefers to take the child downstairs or outside. 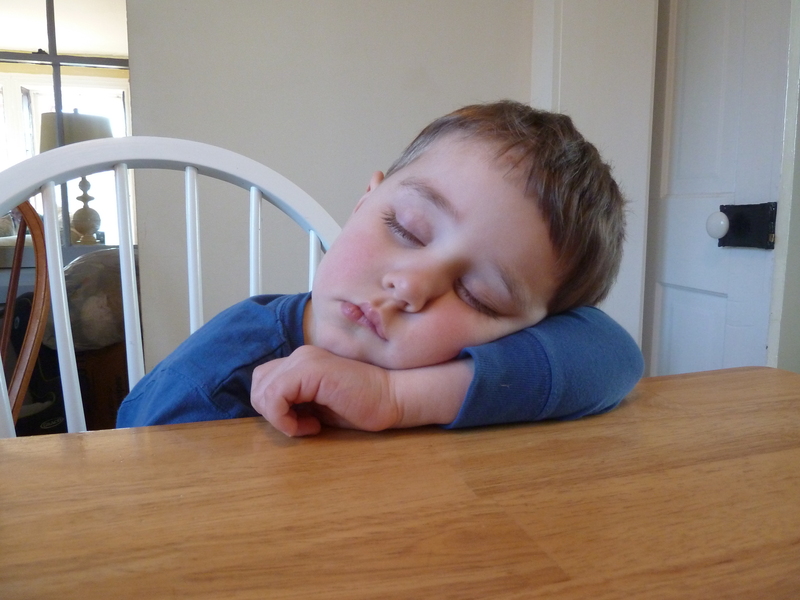 Beyond that age, we start with two simple requirements: Our child is to be quiet (not silent!) and he is to stay in the pew. He may whisper, he may move around, he may climb up onto the seat, off the seat, onto the seat, off the seat – he just has to stay in the pew. Once our child has mastered those two expectations, we add more. He has to stop climbing… he has to stop talking… he has to sit. Ultimately, he’ll have to sit still. (Our oldest is five; we’re not to that last one yet.) We add requirements as our boys are able to handle them and we try to keep them as simple as possible. 4. We talk with our children beforehand about our expectations. 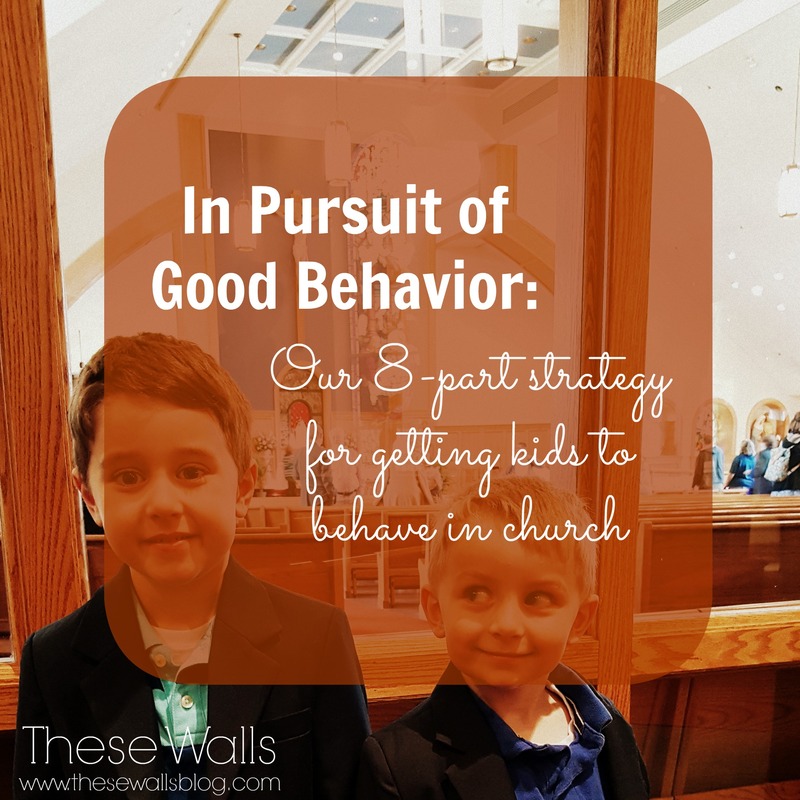 The first Mass behavior expectations we ever voiced to our oldest son were “Remember that you have to be quiet, you have to stay with Mommy and Daddy, and you should set a good example for your brother.” His brother was a baby – he was not yet paying attention to anyone’s example. But the idea that he was the big kid, that he had a big-kid responsibility – it stuck with our oldest. So we still use it. We also have particular instructions for those who need them. One of our sons has a tendency to end up sprawled across the pew, his head on our laps. So he is told to sit up straight. Talkers who think they are whisperers get told not to talk at all. The last part of that line might get me in trouble. To be clear, I don’t mean that we actually ignore our children. I just mean that we utilize those eyes we have in the backs of our heads to monitor them and we reserve the ones in the fronts of our heads for the altar. I try to keep track of what my boys are doing without making eye contact with them. That may sound cold, but I’m just trying to discourage my chatty guys from starting a conversation. Or from doing something silly to make me laugh. So I sit or stand or kneel (as the case may be), my body and mind oriented as much as possible toward the Mass, and I encourage my children to do the same. 6. We snuggle our children. While I try not to engage directly with our children during Mass, I do try to take advantage of those quiet, holy moments to be lovingly, physically present to them. I sit with my arms around my boys, I stroke their backs, I give them a pat. When it’s time to sing, I open the hymnal with them, singing in their ears and tracing my finger across the notes on the page. I hope that our one hour in Mass every week begins to take hold in their little minds as a time for tenderness and love. I want my kids to understand as much as possible about the Mass, and anyway I want to get/keep their interest, so when the time seems right, I’ll lean over and whisper a “Did you hear what Father said there?” or “Can you see what he’s doing?” I offer a quick explanation and then go back to my ignoring/snuggling strategy. If my boys ask a genuine question that can be easily and simply answered, I go for it. But only if the timing seems appropriate and I don’t think we’ll be disruptive to our fellow parishioners. If they’re asking a question that requires a more complicated response, we tell them we’ll answer it when Mass is over. 8. We bring small distractions (just small ones) to church with us. We are a thirsty family, never traveling anywhere without a beverage (and my boys are all pretty much addicted to milk), so I’m sure to always stow their sippy cups/bottle in my purse. They make for a great distraction when the first wave of wiggles hits. But beyond that, we keep it very spare. We never bring snacks, because crumbs and wrapper noises and my thing about thinking tables are important. Sometimes I will bring a couple of quiet toys for a baby, but mostly I keep it to one or two books per child. Just religious ones. The images contained in them not only help to keep the boys occupied, but provide a jumping-off point for their questions and imaginations. And I think that’s important. So that’s how we do it. I’ve probably seen dozens of strategies in my people-observing and blog-reading days, but this is the one that works for us. I offer it here for the curious or the desperate or the only vaguely annoyed. Good luck! 2) Everyone is very, very tired. 3) Pregnancy insomnia is one of the stupidest, most nonsensical things ever. 4) On Saturday, a few of my lovely girlfriends took me to a lovely lunch to celebrate the impending arrival of baby boy #3. I felt just about giddy to be getting out of the house on a beautiful, spring-like day to hang out with my friends and eat delicious, wood-fire pizza. Mmmm… Thank you, ladies! 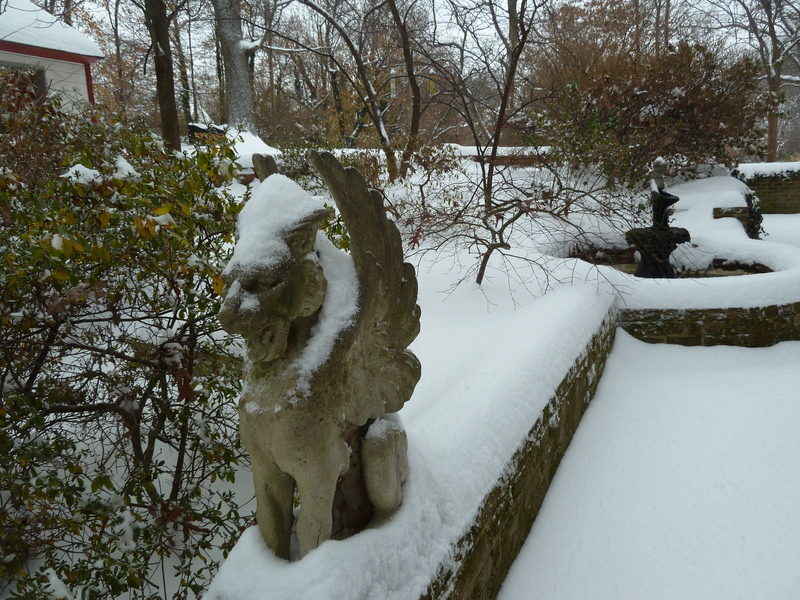 5) There was absolutely nothing spring-like about yesterday, however. 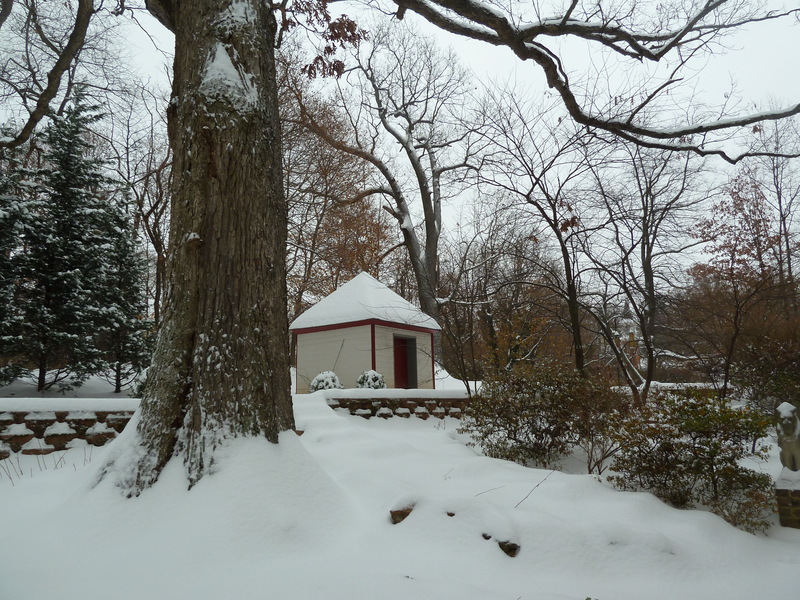 It snowed for something like ten hours straight. On March 25th. Will this winter never end? 6) Change is hard. Or, at least it is for me. Every first day of school, every move, every new job, every new phase of life, every new child – every big change, no matter how wonderful – has been difficult for me to process. I know this about myself and yet I’m always somewhat taken aback when a round of change triggers its inevitable, big, emotional, revelatory moment (which necessarily involves tears). This round’s moment came to me on Sunday afternoon in that most glamorous of places: the driver’s seat of my minivan in the middle of the Safeway parking lot. Boo-hoo. 7) In the scramble to get preparations wrapped up before Brennan’s mother’s arrival on Sunday evening – and the stress, and the exhaustion, and the pregnancy-related discomfort, I didn’t get to mass this weekend. I hate that. There’s no feeling of Catholic guilt quite like that of missing mass. Beyond the guilt-driven regret, though, I feel like I suffer a loss each time I miss Sunday mass. (Fortunately, it’s a rare occurrence.) Missing mass makes me realize how much I depend on it. Whether or not the little ones (or my own distracted brain) have let me pay attention to the readings, whether or not I’ve been wrestling a jumble of little arms and legs, whether or not I’ve been stressed out or agitated, the mass feeds me. Without it, I feel like I go into my week empty-handed. Missing this Sunday’s mass certainly wasn’t the way I wanted to go into this week of welcoming-the-mother-in-law and maybe-giving-birth. 8) All that said, Hilde’s move into our home went just about as smoothly as it could have. She’s got quite a way to go to get things unpacked, but she’s safely here and we’re all getting acquainted with one another. 9) Just about overnight, I have gone from feeling good-but-tired to feeling very uncomfortable and full-of-baby. I feel like this baby is coming soon – like, really soon. But what do I know? 10) I had my weekly ob appointment (and sono) this morning and all went well. My doctor offered to go ahead and schedule my induction for 39 weeks on the dot, which is… next Friday! As long as the hospital’s got room for me, it looks like I should be having this baby by the 4th! 11) I still think I’ll go before then, though. My discomfort level has been prompting many a game of “Is Julie in labor?” The answer so far has, of course, been “no” – but I’m making good progress on the dilation front, so… it could happen! 12) Last week I bought the boys a copy of Frozen to occupy them after the baby is born. Yesterday afternoon I totally cracked and popped that sucker into the DVD player. I may regret it later, but at the moment I was glad to have bought myself precisely 108 minutes of quiet time in which to (finally) pack my hospital bag and (too soon) fret about whether I’m going into labor. 13) Instead, I started writing this post. Priorities. 14) Note: when you’re 8.5 months pregnant and threatening to go into labor at any minute, you should probably give your husband a little warning before venturing out at 6pm to give your mother-in-law a tour of her new town. Because when he arrives home from work to find no minivan, wife, boys, or mother on the premises, he’s likely to panic. Just a little. 15) Another note: eating dinner at 5pm is waaayyy nicer than eating dinner at 9pm. I mean, it gives you actual free time in the evenings that doesn’t involve falling asleep on the sofa. 16) I’ve got a little poll for the mamas out there: While in the hospital after having a baby, do you (a) change into your own clothes or (b) wear the hospital gown provided to you? My best friend and I were having a conversation about this yesterday. On the one hand, we’ve seen pictures of ladies in real clothes in hospital beds and all the cool mommy bloggers seem to dish out great advice on the comfiest clothes to pack in your overnight bag. But we, ahem, don’t understand the logistics of such a move. Real clothes seem awfully inconvenient for all the checking and prodding and poking everybody seems to want to do to you, like, every 20 minutes. And then there’s the not-wanting-to-ruin-our-clothes thing. Are we alone in going the practical, dowdy route or are there more mamas in our camp? 17) One more important question: Is gorging oneself on delicious, home-made (but not by me) bar cookies a sign of imminent labor? 18) We really enjoyed the brief visit from Brennan’s sister and uncle, who drove Hilde here from Minnesota. 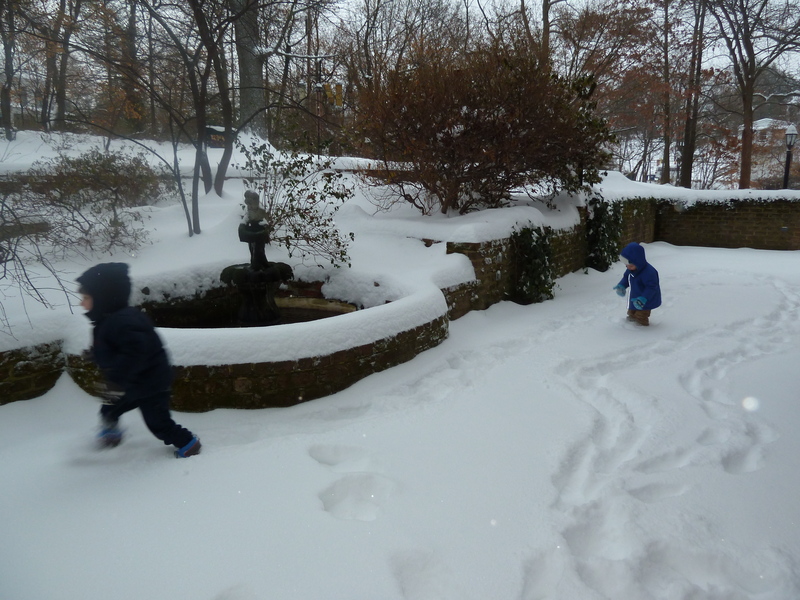 The boys especially enjoyed their aunt and uncle and were beautifully, pathetically disappointed to learn yesterday morning that they’d left before dawn. It was so heart-breaking/cute. 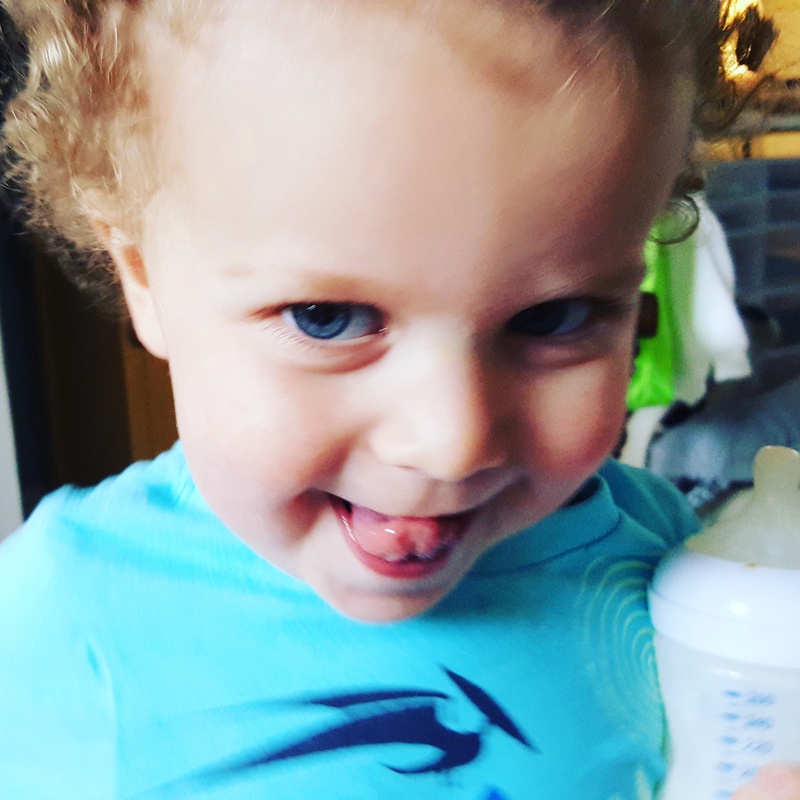 19) I had to carry my two-year-old (under my arm – just about the only way the belly will allow) out of his big brother’s preschool classroom yesterday, literally kicking and screaming, because he didn’t want to leave. It was also heart-breaking/cute. 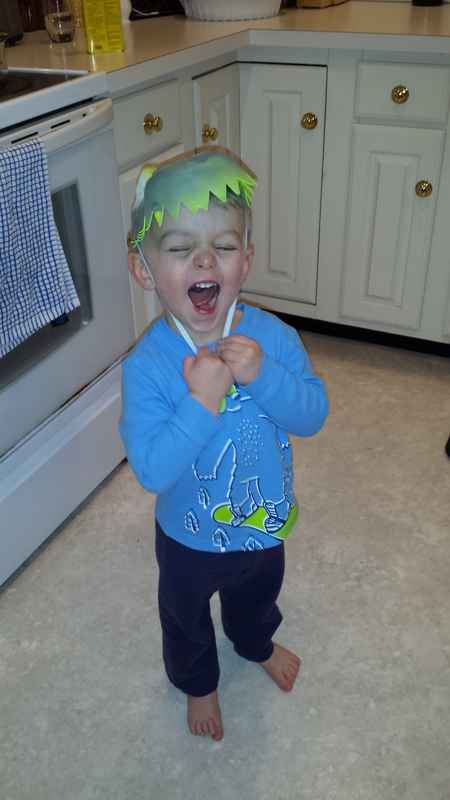 20) Last week my three-year-old said two particularly cute things before heading to school. 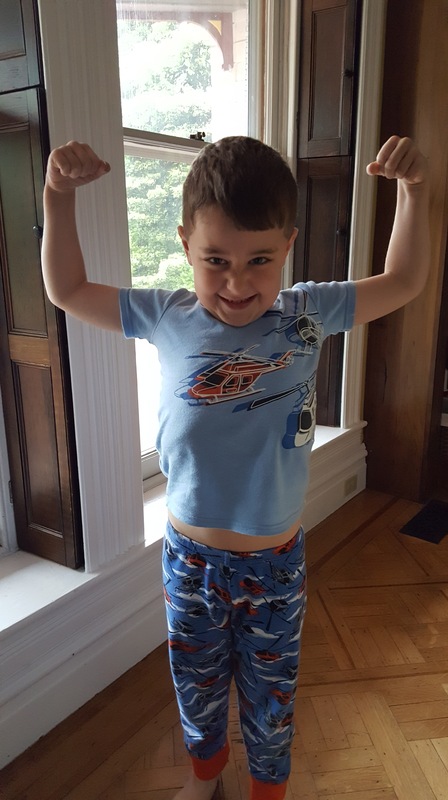 One morning, as soon as he woke up, he said, “Today is my wucky day!” Me: “Why is today your lucky day?” Him: “Because I get to go to school today!” His teacher loved that one. 22) Big brother’s “pwomise” didn’t last long. 23) Fortunately, the little one’s tough. Fierce, we call him. He can take it. I started writing this post as a 7 Quick Takes Friday, so I was all set to open with a “Happy St. Nicholas Day!” but, um… see numbers two and three. The day was fun, but it pretty much sucked the life out of me. Anyway, it took my boys a few minutes to remember/discover their goodie-filled shoes Friday morning, but when they did, their delight was, well, delightful. The little one ran up to me with a look of glee and a shout of “Wa-pop!” and the big one with a “Wook what Nickwas bwingt!” Totally worth the effort it took to remember the whole deal. 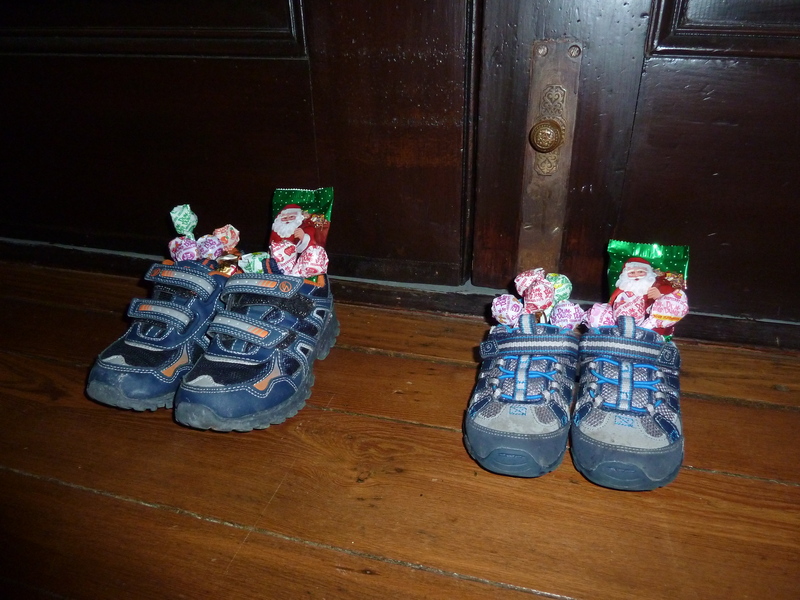 We celebrated the good saint’s feast by hosting a little St. Nicholas Day party for friends. Except it didn’t end up being so “little” after all: we had 18 kiddos (two four-year-olds and SIXTEEN three-and-under’s), plus nine adults. I meant for the party to actually be St. Nicholas-focused: I bought materials to make these cute little St. Nicholas ornaments, I thought I’d do some sort of reading or lesson on who St. Nicholas was, and I planned to print off some St. Nicholas coloring pages for the kiddies to work on. Also, my friends and I had decided to make the party a cookie swap. But… did I fulfill those expectations? No way. Neither the ornaments nor the cookies were made, the lesson was not planned, and the coloring pages were not printed. One friend did bring this cute St. Nicholas book, which I read aloud to the swarming mass of children. But, you know: 18 children. Surrounded by toys. And each other. Very little attention was paid to me and my feeble narration, I assure you. Whatever. For once I was dressed and made-up before my guests arrived. The house was clean-ish and arranged for the party before it even started. And I actually had the food ready (pretty much) on time. Also, we had no injuries, no broken toys, no spills, and no major fights. So the party totally goes down as a win in my book. He’s been like a big, flashing neon sign of hyped-up emotions lately. When our guests arrived, he was so EXCITED he ran around the house screaming and roaring, throwing himself on the floor once per lap to flail his limbs and scream some more. When things didn’t go his way, he was so DISTRAUGHT he sobbed and carried on like he was experiencing an actual trauma. Not like his mother had just told him that no, he couldn’t go outside to play while he had dozens of guests in the house. Especially since it was raining. Then of course when people started to leave, he became HYSTERICAL. He screamed and sobbed and sniveled, wet-faced and shaking, begging for hugs and kisses from the departing children. Those poor kids. No one wants to hug and kiss someone who looks like that. Still, a few of the kind souls obliged him. After everyone left, my little guy calmed down considerably. He was really quite lovely. For about five hours. Then it was back to the grind. Speaking of the grind, I have a potty training question for you experienced parents out there. Or, maybe it’s not so much a potty training question, because (other than nighttime) my three-year-old son is already potty trained. It’s just that he hates going to the bathroom if it’s not his idea. With a passion. The child actually potty trained pretty easily. (I attribute this to waiting so long – more than 2.5 years – to work on it. By that time he was just really, really ready and it wasn’t that big of a deal.) He gets through most nights dry and he hasn’t had a true potty accident in weeks. And it’s common for him to just announce that he has to go and go ahead and go like it’s no big deal. Once he hears our request, he loses it: He claims he doesn’t have to go, he cries, he runs away, sometimes he throws himself on the floor. It’s lovely. But once we get him in the bathroom (sometimes we pick him up and bring him in there, sometimes he comes under threat of a time-out), he goes! He used to stop crying immediately, brighten up, and say (unprompted), “Oh, I did have to go potty! I’m sowwy, Mommy and Daddy!” But increasingly he continues to cry and claim he doesn’t have to go potty while he is actually going. Any ideas as to what this is about or how to address it? We’re several months into this issue and it has gotten very, very old. The morning was something of an adventure for us. 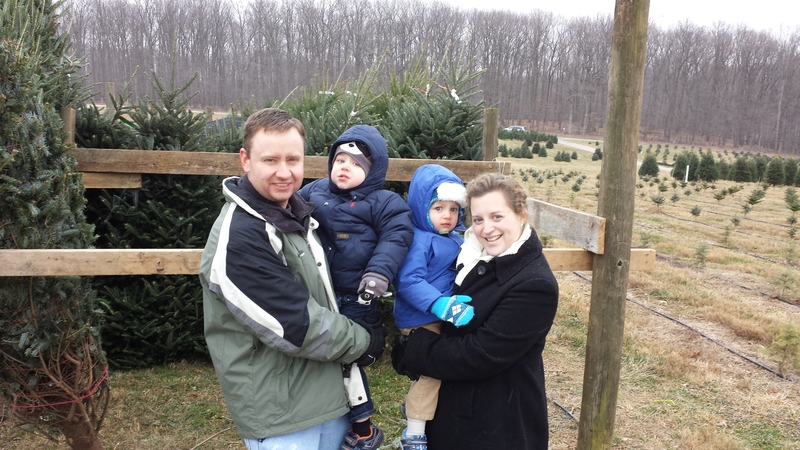 We had planned to make the 9am mass and then head straight to a Christmas tree farm afterward to select our big, honkin’ tree. I’d packed sandwiches and snacks and everything. But as usual, we were running late. We were in the car and ready, but would have been embarrassingly late to mass, so we decided to switch the two agenda items. We went straight to the tree farm instead. 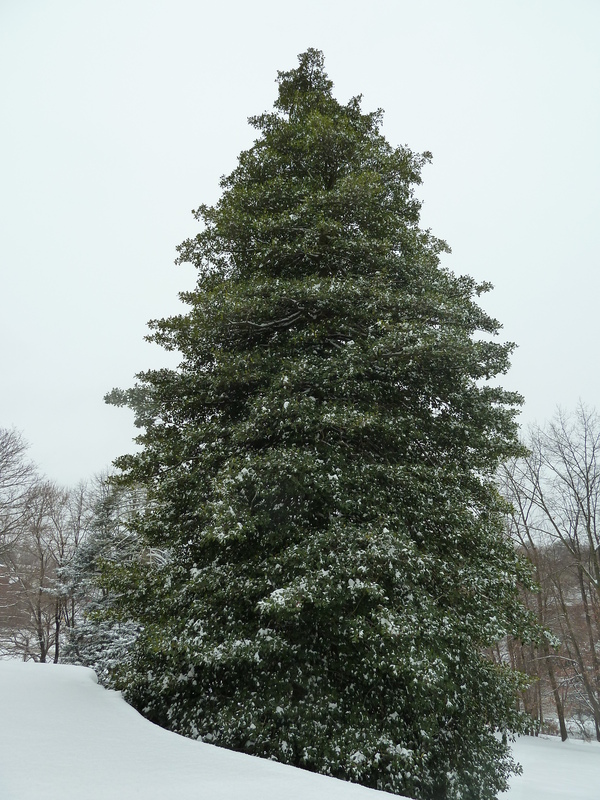 We selected one of the few remaining big ‘uns (12 feet!) as the snow began to fall at 9:30. 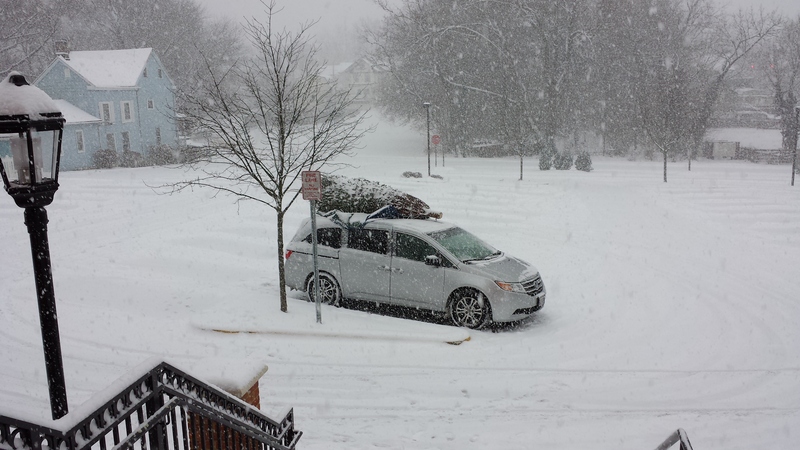 By the time we were on our slow way 45 minutes later, the tree tied precariously to the roof of our minivan, everything was white. 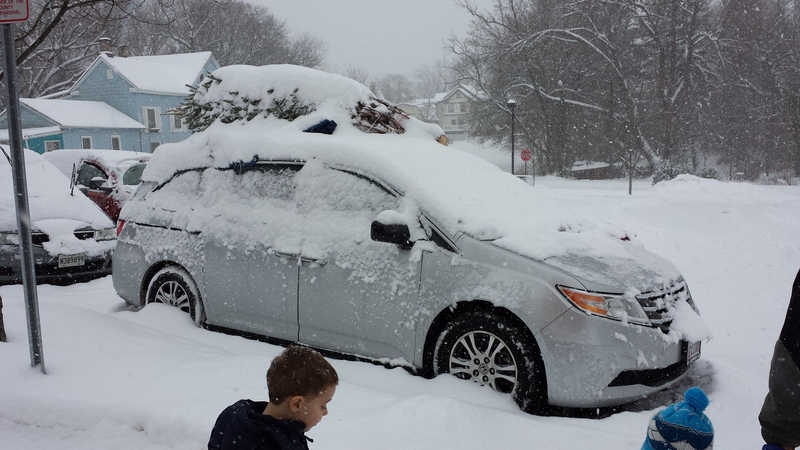 My Minnesota-born hubby, who is normally more than a little impatient with the local slow-snow drivers, was thankful for them this time, because of our Christmasy cargo. We munched sandwiches as we trudged through the snow, listening to Christmas music on the radio. It was really all very happy and festive. We made it safely to our (rural) church and waited in the parking lot until it was almost time for the 11:30 mass. The church, which is usually filled to the gills with hundreds of people, had no more than 30 that morning. So intimate! 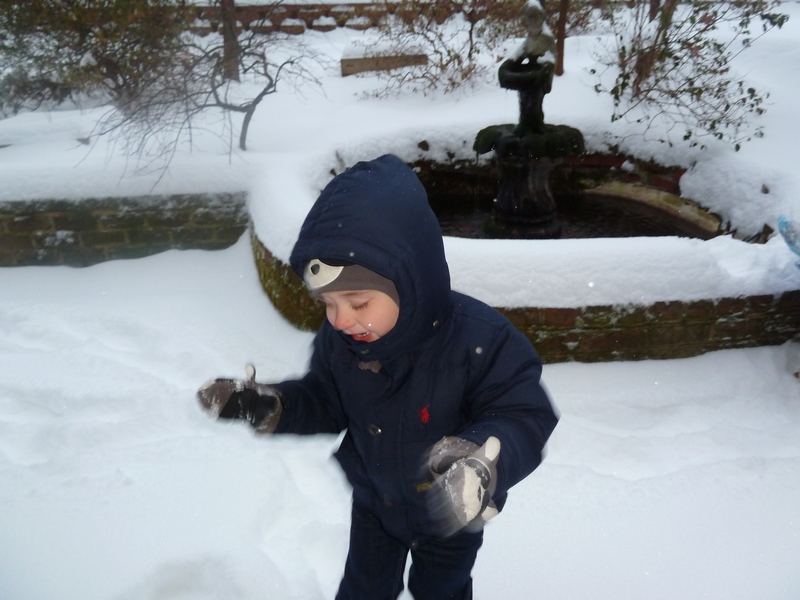 And so revealing of wiggly, whispering, wanting-to-play-in-the-snow toddlers! Really, it was fine. I was happy to have my whole family together at mass. (We spent most of September/October keeping one or both of the boys home because they had a series of awful colds and are too little to know how not to cough all over strangers. 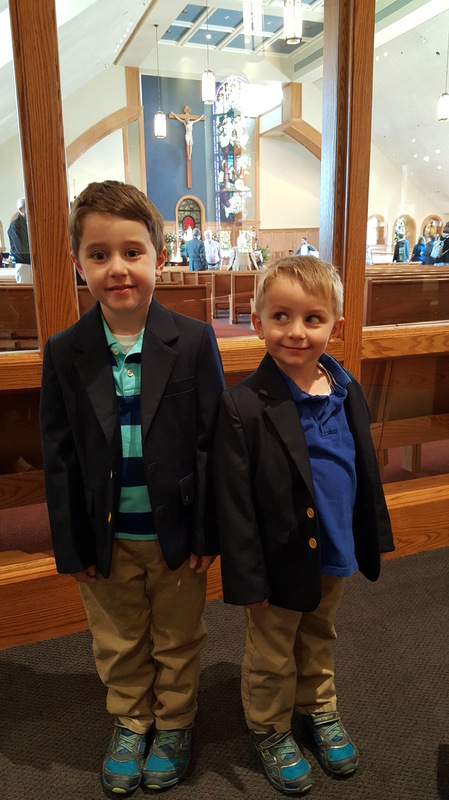 November was challenging because I had to cantor/sing in the choir a few weekends and Brennan doesn’t feel comfortable monitoring the boys by himself during mass.) 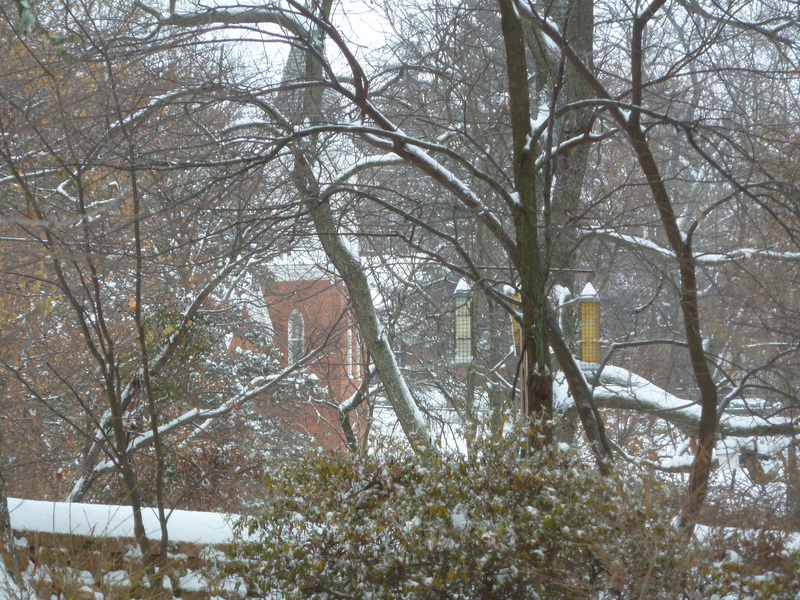 And anyway, it was so lovely to watch that snow fall outside those tall church windows. 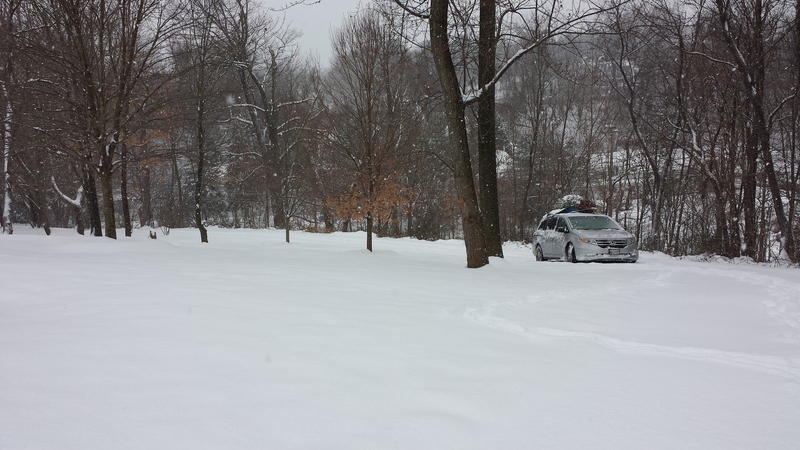 Still happily under the romantic spell of the swiftly-falling snow, my daring, brave Minnesotan chose to take the (unplowed?) curvy, hilly back roads home. The trip was a little stressful at times (like when we couldn’t see anything but white out the windshield), but we made it home safely. If only it hadn’t ended up taking Brennan five hours of shoveling, scraping, and snow-blowing to get the van all the way up our long, steep driveway. 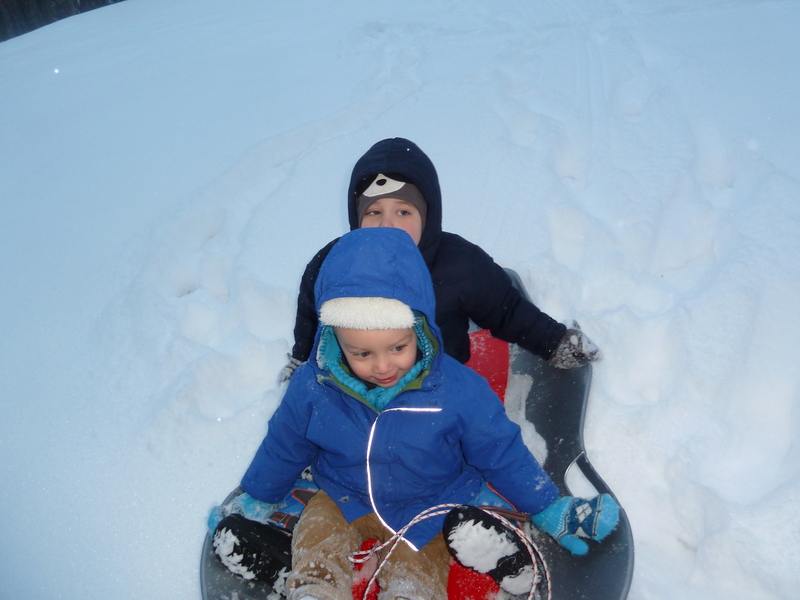 While poor Brennan worked on the driveway, I took the boys out to play in the snow. 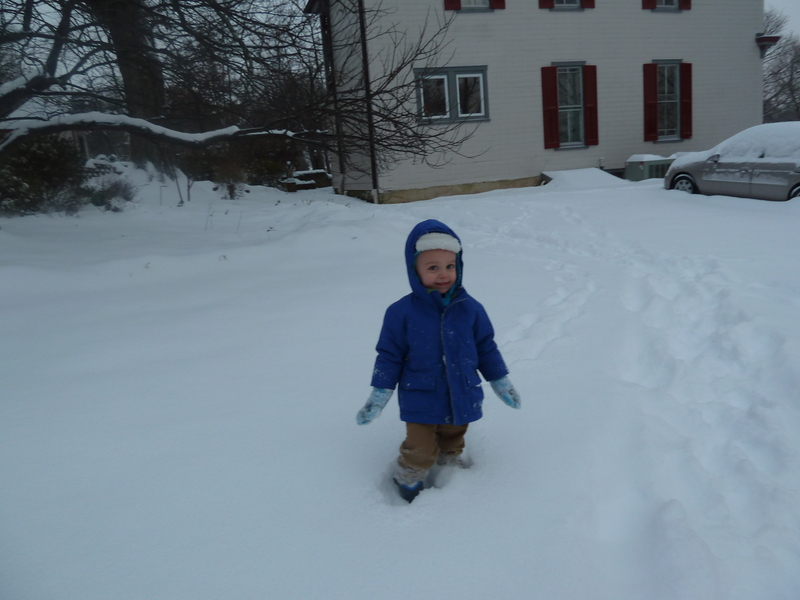 Last winter was mild, so this was our two-year-old’s first opportunity. It was only the second or third for our three-year-old. Naturally, they were captivated. Have a great week everyone! Stay warm! Oh, and by the way: he successfully made it through his “Happy Birthday” serenade without screaming. He did, however, squeeze his eyes shut the whole time, likely thinking that if he couldn’t see us, we couldn’t see him. In last week’s Quick Takes, I announced my new Facebook page for the blog… but I forgot to include a link. That’s brilliance for you. So here you go! If you haven’t “liked” These Walls on Facebook, I hope you’ll stop on by! Living in the greater DC metropolitan area, just about everybody I know has some relative who works for the government. Most of my closest friends have at least one income earner who is employed by the federal government or a government contractor. So what’s everybody worried about right now? That’s right: a potential government shutdown! I don’t know, it might not be big news in the rest of the country, but it sure is here. I’m saying a couple of prayers today that someway, somehow, people find a way to work together to avoid this thing. Okay, I’m going to fit in just one more thing to round out this very quick little Monday Morning Miscellany and then we’re off to continue our birthday celebrations. Mass tips. That is, tips on how to get your children to make it through mass without anyone going crazy. A couple of weeks ago, Rosie (who has four small children, including infant twins) at A Blog For My Mom posted a list of helpful tips and encouraged readers to weigh in with more. If you’re trying to figure out how to get your little ones through church, stop on over to Rosie’s to check out what everyone had to say. I really loved that there was such a variety of strategies: a perfect illustration of the differences amongst children (and parents too). Two sort of foundational tips from me first, though. (Part of which Rosie alluded to. And Auntie Leila writes about frequently.) Unless you were given the most naturally docile children in the world (Ha! ), I think you have to have at least two things in order for any of those tips and strategies to make a difference. (1) Your children have to have some regular practice in sitting in one place (note that I don’t say sitting still). If they can’t sit in one place for the course of a 30-minute meal, they’re not going to be able to make it through a 60-minute mass. (2) There has to be a given expectation that your children will obey you. If they’re not expected to obey your (sometimes loud? Mine are often loud!) directions at home, they’re not going to obey your whispered directions in a crowd of hundreds of strangers. So, work on (1) and (2), and then be creative about what little things will help your particular children to make it through your particular church service quietly enough to (a) not embarrass you, (b) not distract your fellow parishioners, and (c) eventually learn to get something out of it. Because that last one is really the point, isn’t it? 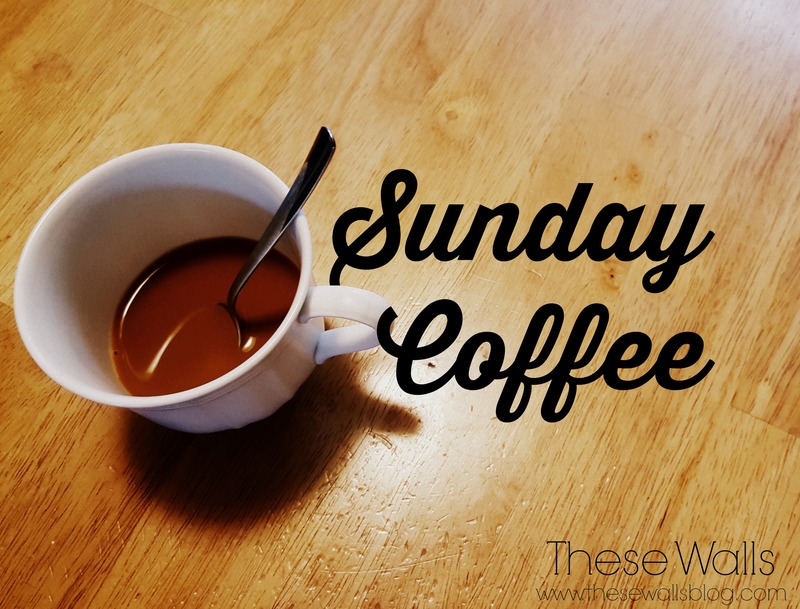 Grace of the always-worth-visiting Camp Patton is trying a new link-up today called “Sunday Best.” The idea is to blog on your “Sunday Best” clothes and/or your children’s “Sunday Best” (or far from best) behavior at church. I’m in! Anyway, I’m not going to post a photo of the outfit I wore to mass today. 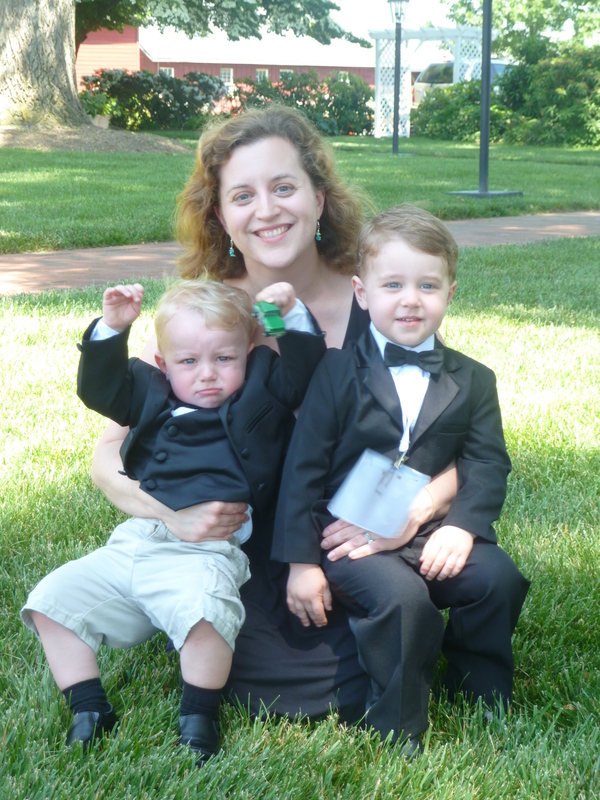 Because (1) I have a head of frizz in this humid summer weather, (2) I’m sunburned and exhausted-looking after the wedding we attended yesterday, and (3) I’m one of those self-conscious moms who (almost) never takes pictures of herself. Yep, that’s me. I admit it. 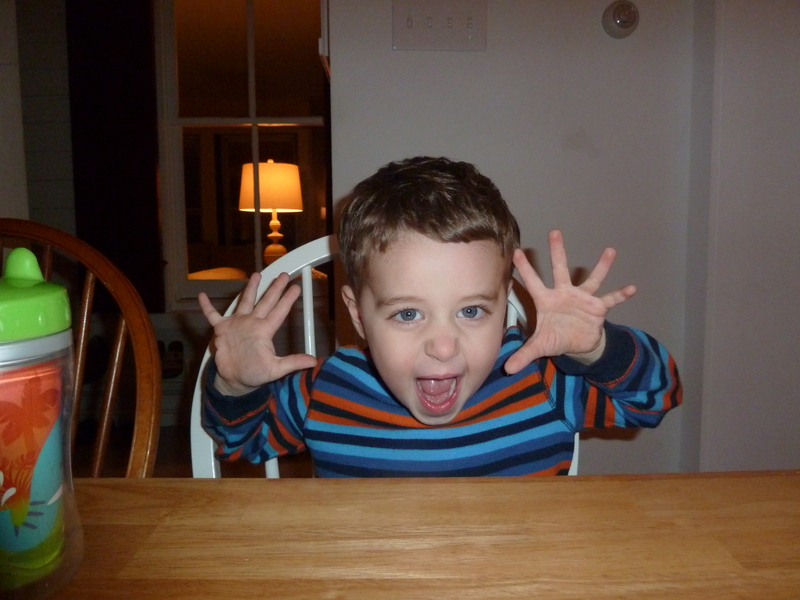 The almost-three-year-old is usually very well-behaved in mass. (At home? That can be a very different story. But in mass, thankfully, I can normally count on an ‘A’ performance.) The 20-month-old usually does pretty well through the homily, but around the consecration (perfectly timed, I know) he turns into something like the above and the hubby rushes him out. On a much nicer note, I have to mention that our parish held a Eucharistic procession through town directly after mass, in honor of Corpus Christi. It was the first such thing I’ve participated in. Years ago when I was studying in Germany, the little Bavarian town I was living in hosted a HUGE Corpus Christi procession, complete with hundreds of people wearing lederhosen and dirndls. And I MISSED it! I had signed up for a day trip to Neuschwanstein, not realizing that (1) it was scheduled for Corpus Christi and (2) that meant that the town would be overtaken by processing Catholics. A dear friend photographed it for me because she knew I’d love it, but missing the procession remains my greatest regret of what was otherwise a fantastic summer. Our participation in this morning’s (1000x much) smaller procession lifted my spirits and went a tiny way toward removing my regret at missing the Prien am Chiemsee version. 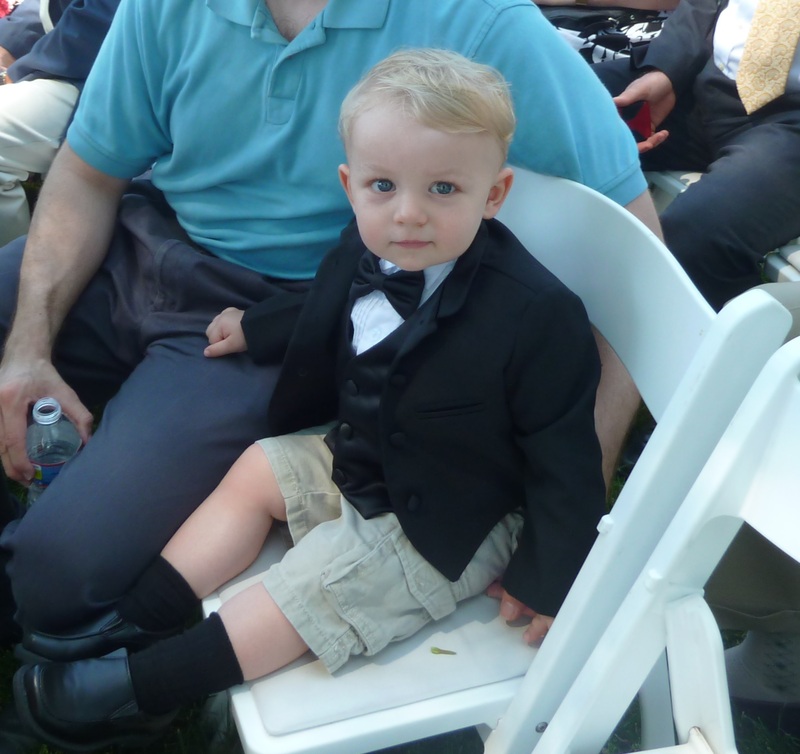 And here’s one of the littlest guy. 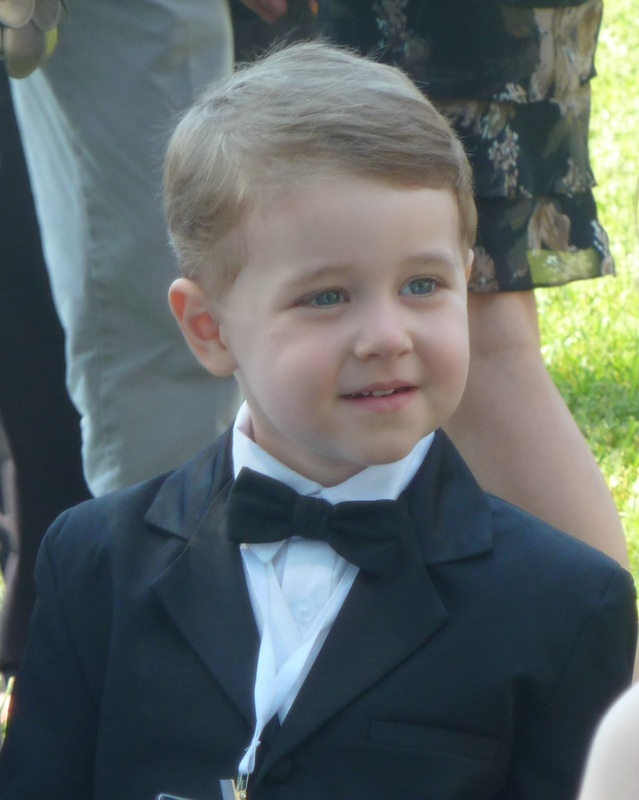 We borrowed a friend’s toddler tuxedo so he could be just like his big brother, but, um… something got lost in the shuffle. Good thing he’s cute enough to pull off any look! So head on over to Grace and check out the rest!